The Power Hits Exchange is officially open for business and the upgrade options are fully functional. The link between the Power Blog and Power Hits Exchange is operational. 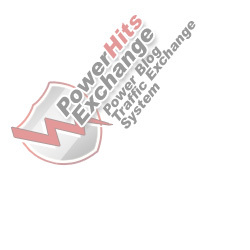 Make sure that you get a Power Blog when you sign up for the Power Hits Exchange. Our users can cancel membership and be removed from all newsletters and databases. To do this a link is provided at the end of system generated email messages from Power Hits Exchange, click the link and you will be taken to a web page where you may choose to be removed from just newsletters or the entire database.